TRICO's freight elevator cabs are constructed from heavy, 14 gauge sheet metal. Each panel contains mounting holes for quick, on the job installation. In addition, each freight elevator cab contains a hinged emergency escape hatch and two flush mounted fluorescent light fixtures. The light fixture cut outs are made specifically to meet your needs. All freight elevator cabs are fully assembled in TRICO’s shop prior to shipment, then labeled so that installation can be done quickly and easily. 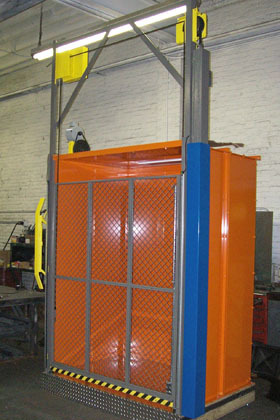 For extra added protection, steel channel or oak bumpers are also available for your freight elevator cabs. TRICO also offers freight elevator platforms as well as freight elevator slings. To order your freight elevator cabs, contact TRICO at (718) 349-6565, download our brochure, or e-mail us at orders@freightelevatordoors.com. Our knowledgeable employees are standing by ready to assist you with any questions you may have concerning freight elevator cabs or any of our other products.